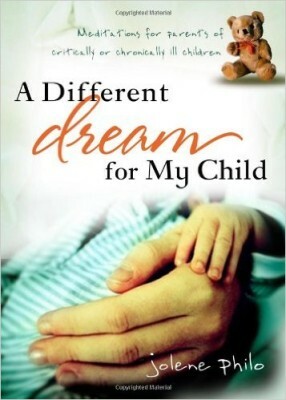 What readers are saying about A Different Dream for My Child . . . Powerful, insightful, and candidly honest . . . Jolene’s words deliver both comfort and biblical counsel on the diverse and complex emotional, spiritual, relational, and practical aspects of caring for sick children. If you have experienced or are living in deep sorrow brought on by your child’s condition, I recommend that you open this book and allow the balm of understanding to meet you where you are at . . . to help ease your ongoing ache, your loneliness, and your feelings of isolation. What a tremendously helpful and inspiring book! . . . With each devotion, my spirit was lifted into a hope I have rarely felt in the midst of the battle. I highly recommend this book to any parent whose dreams for their children have been sidetracked by illness.